Bob the Birder: Its never over till its over. Had to collect Jan from a railway station (unknown at time of going to press) after her fact finding tour of the EU at least a small part of it. 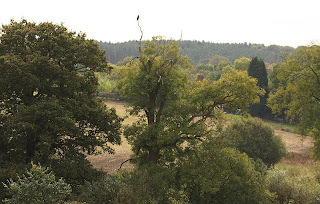 So it was another local walk around Grendon. When you are limited for time its useful to be able to visit 2 places at the same time. 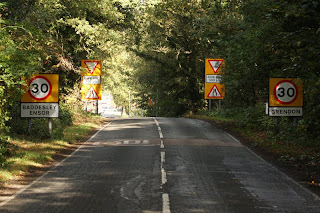 The photo might help explain why the residents of Baddesley and Grendon often appear confused. In terms of bird life there was nothing particularly unusual. 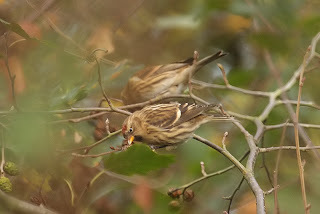 There was a small flock of Redpoll on the Grendon Common plantation which may well develop into a sizeable flock as the winter draws on and pull in one or two Mealy's as it did last year. On Waste lane there was also a small flock of Song Thrushes and that was about it really. There was no vis. mig. at mid morning. 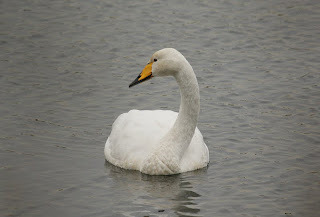 Just when I thought I could have a little Blog before Jan rings up to tell me which station I've got to head for, I get messages from Tom and big John with info about 4 Whooper swans at Shustoke. Would you Adam and Eve it. After all I've said about Shustoke. Have I got time? Have to make time. 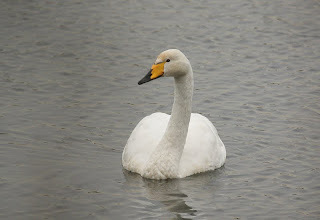 So its over to Shustoke, Whooper swans are a scarce bird in Warwickshire so well worth the effort. When I arrived Steve Haynes, Paul Hyde, John Harris and another local birder are looking at the Swans from the car park, about as distant as they could be from the Swans. I managed to get a little closer before having to dash back to pick up Jan.